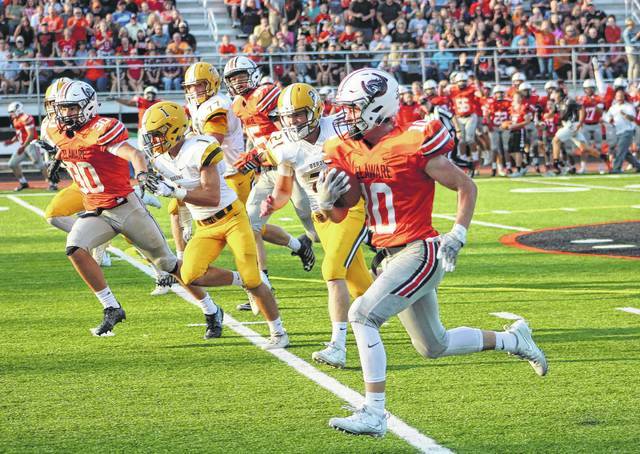 The Delaware Hayes football team felt the thrill of victory; forcing three second-half turnovers to hand rival Buckeye Valley the agony of defeat in a 21-17 come-from-behind victory Friday night at Cornell Stadium. Buckeye Valley coach Matt Stephens has seen this movie before. A fumble inside the 10-yard line as his team was going in for the go-ahead score in the fourth quarter derailed any chances of winning last year. This time, it was Delaware’s Josiah Naegele who made the key fumble recovery off an exchange between quarterback Grant Owens and running back Teren Wycoff at the 4 as BV tried for the go-ahead score. “It’s an eerie feeling, like this was two years ago here … very similar going into that same end zone. We fumbled on that opposite hash,” he said, pointing to the left hash towards the south end zone. Trent Davies set up first and goal at the 7 after a 3-ard run on third down kept the drive alive. But, his helmet came off on the play and he was forced off the field. Stephens was happy to have Davies, who had surgery before the season leaving the opener in question. “He got cleared and we got him reps this week in practice and he looked good,” Stephens said. BV came out strong, building a 17-7 lead in the first half on a 71-yard slot-screen pass from Owens to Joey Verdes in the first quarter and a 38-yard Felippe Scharff field goal and an 8-yard touchdown run by Davies in the second. Verdes missed the second half with a quad injury. Delaware struck first on a 55-yard touchdown run by Blain McCormick for an early 7-0 lead. When all seemed lost late in the half, McCormick went 69 yards for his second touchdown to cut the deficit to 17-14 before halftime. The Pacers (1-0) spent much of the third quarter in Buckeye Valley territory thanks to Mason Davis. Davis recovered a fumble to set up the Pacers’ go-ahead touchdown – a 31-yard jump-ball reception by Todd Toney, who is 6-foot-6. It was quarterback Luke Jackson’s first touchdown playing in relief of Kael Gannon, who was out with an injury. “I just saw the ball squirt out and I fell on it,” Davis said of his recovery. Davis stepped in front of an Owens pass at the BV 41 to end a drive that seemed promising for the Barons. “Our offense kept us in the game and our defense did great … it was a total team effort tonight,” Davis said. Davis and Chris Johnson each made big plays to turn BV over on downs late in the third quarter. Davis broke up a 3rd-and-3 pass before Johnson secured a tackle on a 2-yard pass completion from Owens to Beau Ewing on 4th down. Delaware handed BV three possessions in its own territory in the first half on a pair of fumbles and a turnover on downs, which led to Scharff’s field goal and Davies’ touchdown run. “We made the game really hard on ourselves for a while,” Golden said. Hayes’ Jason Mathus (35) and Virgil Rhodes (27) box in Buckeye Valley’s Trent Davies during the first half of Friday’s season opener in Delaware. Hayes’ Blain McCormick (10) breaks free down the sideline on the way to a touchdown during the first quarter of Friday’s showdown in Delaware.